Voltaire was a controversial man who possessed immense talent and whose versatile and prolific writings criticized religious dogma and intolerance. In fact, it was many of his ideas that lit the way for the Age of Enlightenment. However, Voltaire’s light that had shone so bright for so many years began to dim soon after he returned to Paris in February 1778, having been absent from Paris for 25 years. 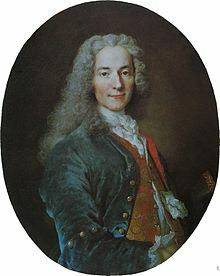 It began around the end of April when Voltaire complained he was suffering from severe pain in his lower abdomen. To gain relief, he took wine and quinine. A few weeks later, Voltaire was tired and knew he would not be able to attend a meeting he had scheduled for Monday. However, to make sure his voice was heard, he stayed up and worked most the night on Saturday, 9 May, aided by excessive amounts of coffee to prevent himself from falling asleep. Voltaire’s decline continued and his bowels refused to move. On Saturday, 23 May, it was clear the end was coming quickly. By now he was no longer eating and he had stopped talking. Earlier, when he had been well, Voltaire had taken up the cause of a wrongful death for the son of a man whom he knew personally but did not like. The man’s name was the Count of Lally and his son was Gérard de Lally-Tollendal. Count of Lally’s Execution. Courtesy of Wikipedia. Voltaire’s deist beliefs and his constant criticism of the Church meant there was to be no Christian burial. Instead, it was planned that his body would be interred in Ferney, the spot that was Voltaire’s home from 1759 to 1778 and located in the Ain department in eastern France. He was to be entombed next to his library in the bathhouse. The day after his death, on Sunday, 31 May, a post-mortem was conducted. Voltaire’s corpse was embalmed, his brain retained by the local apothecary, and his heart given to the marquis de Villette, a French writer who was Voltaire’s protégé. After dark, Voltaire’s corpse was dressed, and to make the journey to Ferney, his brainless and heartless body was tied in an upright position to the carriage. Of course, once the carriage got underway, it quickly became obvious the brainless, heartless corpse was not up to the journey. Procession for Transfer of Voltaire’s Remains to the Panthéon. Courtesy of Bibliothèque nationale de France. For Voltaire, the monastery was not to be his final resting place. About thirteen years later, on 9 May 1791 his body was exhumed, and two months later on 11 July, he was enshrined in the Panthéon, after the National Assembly decreed that his body be brought back to Paris. The night before the procession to the Panthéon, his coffin was placed in the ruins of Bastille and the following day, the procession to the Panthéon was a major celebration. It is estimated that the procession stretched from one side of Paris to another and that a million people attended it. Some people thought the procession was pompous and maintained that such a lavish funeral should not have been given to “a man who had spent his life in ridiculing religion, and corrupting morals.” Yet, the ceremony lasted nearly twelve hours. Transporting Voltaire to the Panthéon. Courtesy of Bibliothèque nationale de France. After the revolution of 1830, it was unclear if Voltaire’s remains were still at the Panthéon. This was because rumors circulated that they had been removed by royalist fanatics. Years later, in 1897, it was decided his tomb should be checked and on 18 December 1897, it was opened. Voltaire’s remains were there.